Bob and Mike Bryan came from a set down to win a record 62nd ATP Tour doubles title together with a gripping victory over Eric Butorac and Jean-Julien Rojer at the LA Open on Sunday. Mike Bryan struck the winning shot, coolly putting away a forehand volley, to earn the American siblings the decisive golden tiebreak 10-7 for a final scoreline of 6-7, 6-2, 10-7 at the LA Tennis Center. He then leaped toward his brother, hooking his legs around Bob's waist in jubilant celebration, as resounding cheers rang out across the stadium court. 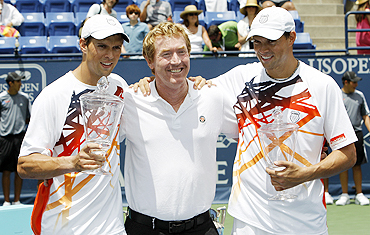 The Bryan brothers, competing in their 100th final together, edged past the record of 61 ATP titles they had previously shared with Australians Mark Woodforde and Todd Woodbridge. "The Woodies put a record way out there and 61 was a Mount Everest when we first started out," Mike Bryan said courtside. "We've had a good run and to get this is really special." His brother Mike added: "It means everything and to have Mark Woodforde here (watching) is awesome. We really looked up to the Woodies. We learned so much from them. They were a class act." Asked where this achievement ranked among all the other honours they had piled up together on the circuit, Bob Bryan replied: "It's got to be the top. It's an incredible record. "I've been playing with Mike since I was six years old. If we stop today, we are going to die happy people." Top seeds for the doubles, the Bryan brothers were heavy favourites going into Sunday's final against a combination playing together for the first time. However the partisan home crowd was left in stunned silence when the US duo lost the opening set 8-6 in a tiebreak to American Butorac and Rojer of the Netherlands Antilles. Both pairs struggled to hold serve in the second set and there were five service breaks before the Bryans established a 4-2 lead in bright sunshine at the LA Tennis Center. Mike Bryan held serve to stretch the advantage to 5-2 before the American brothers levelled the match at one-set all when the right-hander struck a backhand service return winner off Rojer. The Bryans cruised ahead 5-0 in the first to 10 golden tiebreak before their opponents clawed their way back to 7-7. However, a Butorac double fault gave the Bryans a decisive edge at 8-7 and the end was not long delayed. 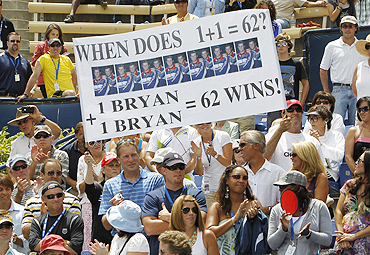 California-based Woodforde paid tribute to the Bryans after the Americans won a record sixth title together in Los Angeles. "For the last few years, you have been travelling in elite company," Woodforde said. "Based on today's victory, you are now in rarefied air. "This 62nd victory has been waiting since May but I think floodgates will open entirely. Seventy, 80 titles is quite possible."